This section contains photos taken recently with some comments, a blog. These pictures also appear in their respective categories if there is an album yet. Use the "Map This" button at the top right to see a map with the photo locations pointed out on it. If you need help in finding places, or if you are visiting the area and would like some more input on places to go, drop me a line at pix [at] mtnsub [dot] org. (you know what to do with the 'at' and 'dot' thingies...) If you would like to follow this gallery using an RSS reader here's the link: RSS. Special moves do not heed the weather so our intrepid photographer once again braved the Belgian drizzle and cold for a high-ISO picture. This time the object was the weed control train, a sure sign of spring. 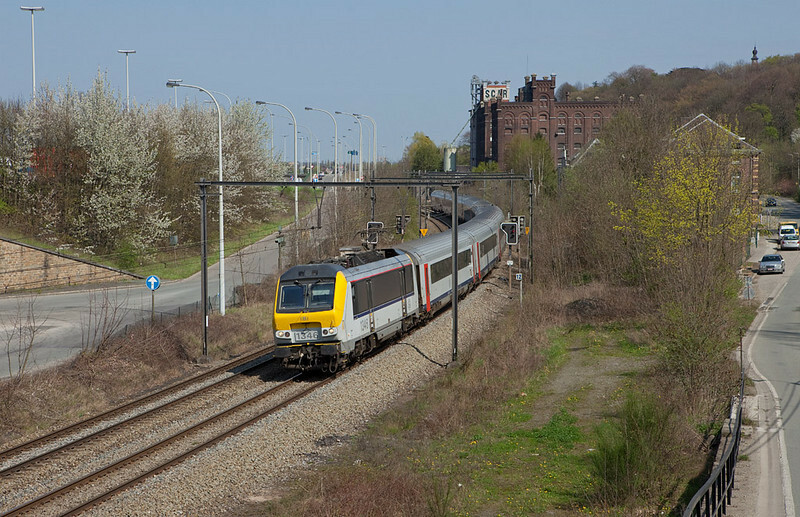 It was booked to run through Welkenraedt around noon and is seen here returning from the easternmost active part of the Belgian rail system, the L49 between Eupen and Welkenraedt. Note nose-mounted camera for the operator and spray coming from nozzles on the first gray car. Although all but indiscernible today, this location - Herbesthal - was once the site of a large passenger station, freight yard, engine service facilities, and border control station when the Belgian-Prussian frontier ran through here before the treaty of Versailles. The second track from the right serves as the lead to what little remains of the extensive freight facilities located out of view around the curve. 6267 and 6288 top and tail the weed control train into Herbesthal from Eupen. This is "weird 66s week" apparently. This morning a Euro Cargo Rail unit (technically a class 77, but essentially the same thing as a 66) was testing on the L24. It is here seen running back and forth across some new balises installed on one track near the Rue d'Aix underpass. There were EMD people in the rental car accompanying the trials. 7 degrees, blowing wind, and pouring rain. At least the bright paint scheme cheered the freezing photographer up some. ECR 77 005 testing at the Rue d'Aix in Moresnet. While eating dinner tonight I saw my first Captrain-repainted 66 roll down towards Aachen and set out after it. Captrain has taken over Veolia's franchise and licenses, which in turn was mostly inherited from Rail4Chem when BASF et. al. decided to quit the rail freight business. They took forever to come back up with their trainload of new automobiles so the remaining light gave a less than inspiring illumination of the scene at the Rue d'Aix. Nevertheless this is one of the more imaginative paint schemes to grace the Canadian units. The cargo in itself is interesting as they are new 2010 Buick Regals, americanized versions of the Opel Insignia. They are destined for export to the US via Antwerp. Captrain 6601 with westbound auto train passes the Rue d'Aix in Moresnet. It's Queen's Day in the Netherlands and fittingly enough the sun chose to smile down on the festivities. 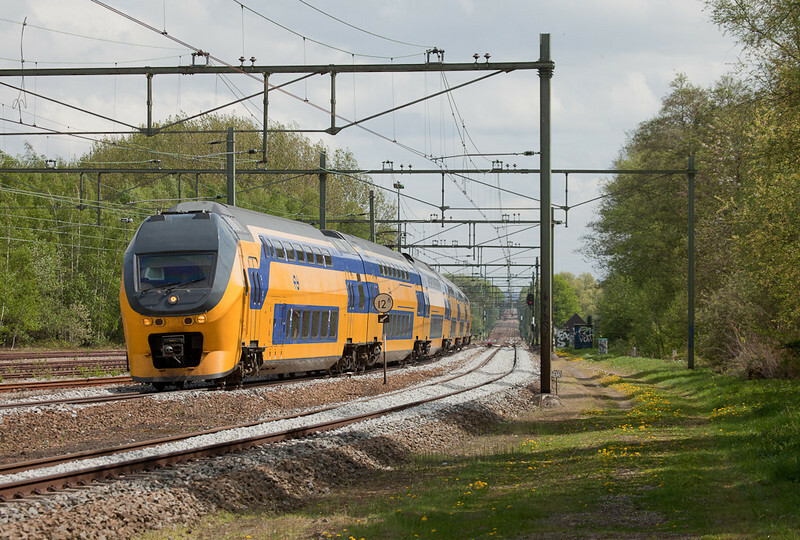 A northbound IRM has started to swing around the sweeping curve through Nuth station on its journey towards Eindhoven. A visit to Eilendorf was in order today in search of spring color. DB Schenker decided to pinch hit for Mother Nature and sent along a rather red class 145 on the Ambrogio intermodal. 145s are relatively rare on freights, but the Ambrogio usually rates one. 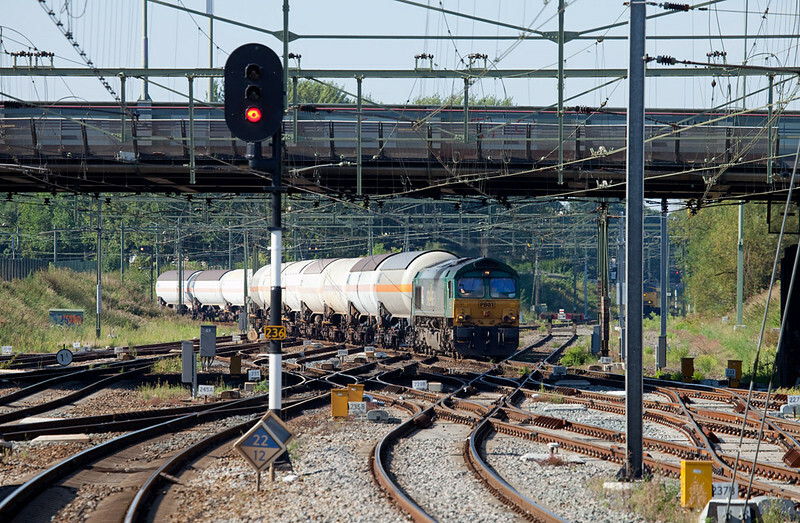 Rail freight seems to be on the rebound lately with long trains (as evidenced here) and lots of extras. Steel and automobile traffic especially run heavy. Export traffic from Arcelor-Mittal's recently reactivated Ougree furnace near Liege adds to the mix. 145 055 on the 40098 (Gallarate/I - Muizen-Goederen/B) rushes through Eilendorf. 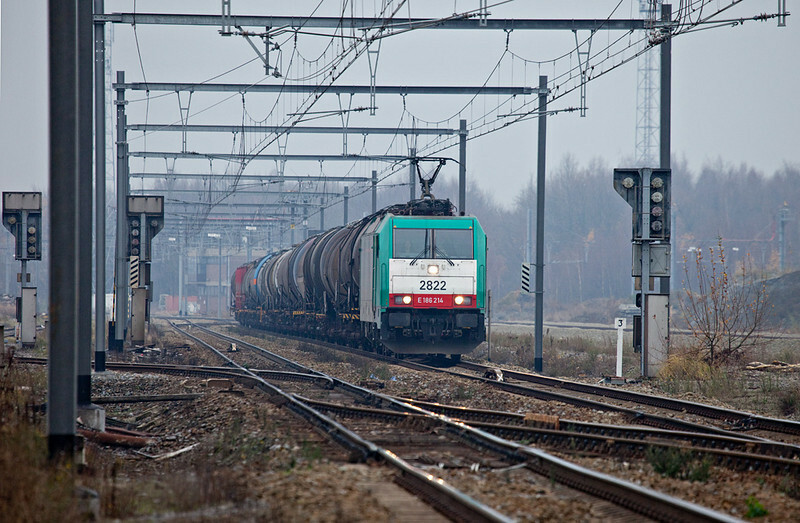 The train is one of the Antwerp-Basel/CH runthrough oil tankers. 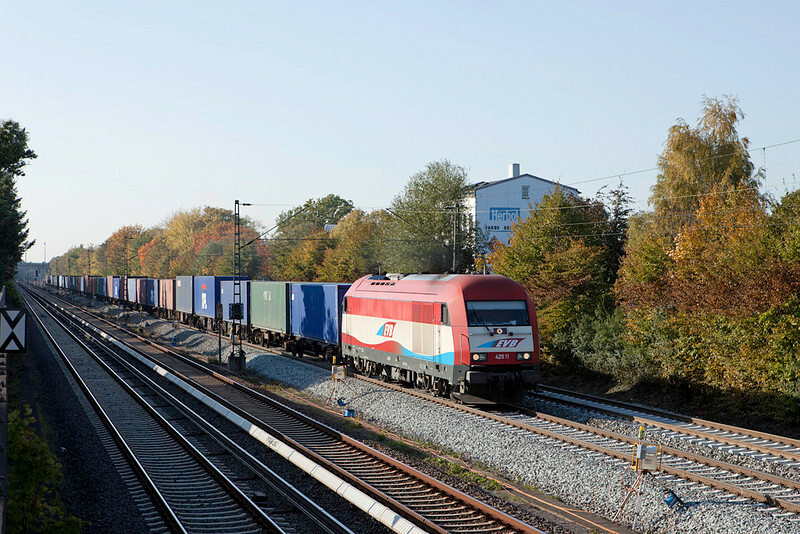 B-Cargo is experimenting with 40 cars doubleheaded, but for the time being most of these trains run with just 20 cars and a single engine. Judging from the blower noise it is enough of a load for a single Traxx. 2824 leads the 47067 (Petrol - Basel SBB/CH) towards Gemmenich. A quick spin around the Paysage de l'Ardenne Bleu after work netted a couple nice and sunny shots today. Compared to last year we are a full three weeks behind as far as vegetation is concerned, you can see there's only a thin green displayed by some of the trees and the nights are still frosty. 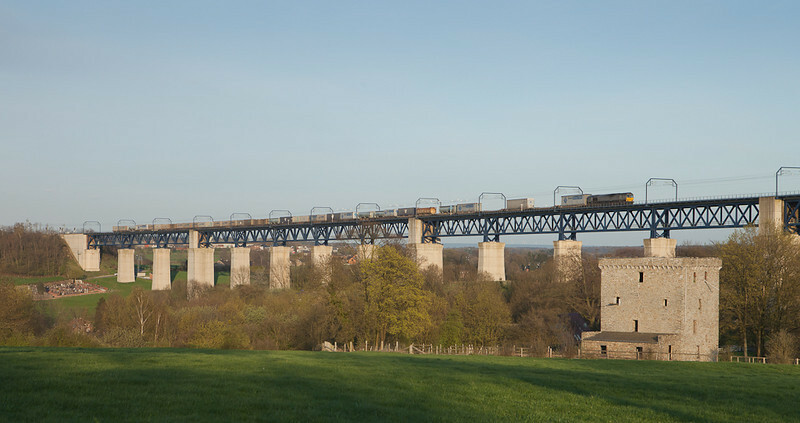 Here's a shot I had wanted to do for a good while, looking north from Moresnet towards the west side of the viaduct. The area is famous for its old chateaux, both bonafide medieval structures as well as 19th century industrial tycoon replicas. Most of what is left of one of the former is the nicely restored tower in the foreground. 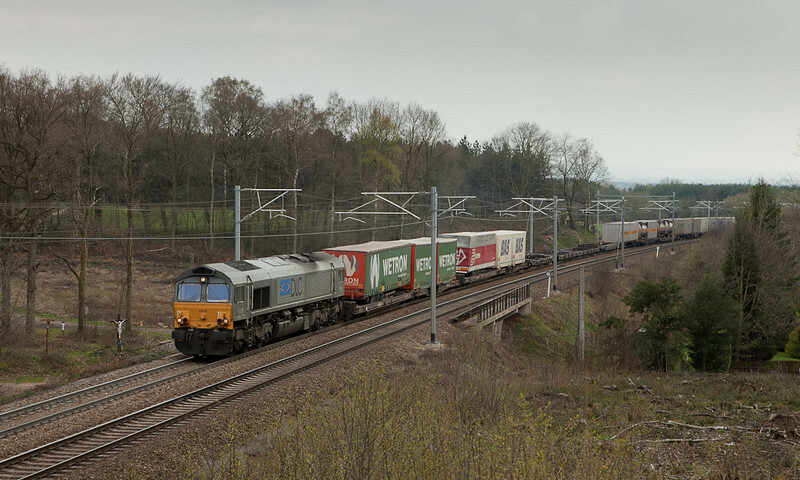 The Ewals train - in the capable hands of one of Crossrail's class 66s - is stretched out onto the bridge as it approaches Montzen. Ewals intermodal 40162 (Novara/I - Genk-Zeehaven) starting out onto the Viaduc de Moresnet. Two weeks have passed and spring still is not really here. Apart from daffodils and a few tulips Mother Nature is skeptical about the freezing nighttime lows it seems. Infrabel has done a splendid job of vegetation control at the Rue d'Aix in Moresnet, resulting in a nice open view of the broad curve there. If you look closely (and your monitor is adjusted correctly) you will be able to see the Eifel mountains in the distance, a good 25 kilometers away. Crossrail's PB18, still wearing its full DLC livery, brings an Italian-bound intermodal uphill in fine style on this Friday evening. 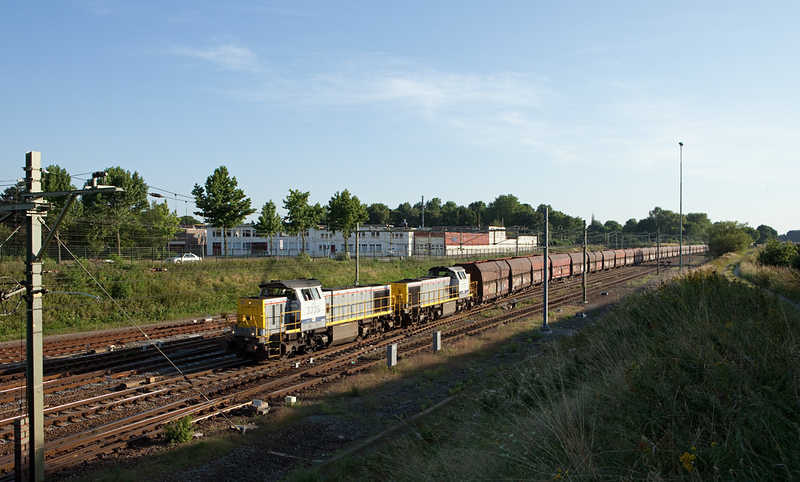 PB18 leading the 43671 (Genk-Zeehaven - Gallarate/I) over the Rue d'Aix. It's been a while since the last picture update. As usual the February/early March timeframe tends to be reserved for some vacation, with the remaining time spent cuddled up close to the radiator and out of the rain. Here's PB02 enjoying a bit of early spring sun next to the customs hall in Montzen. The blue containers are used for sand and oil storage. Ascendos Rail Leasing (Crossrail) PB02 in Montzen. After several days of light but persistent snowfall the sun decided to pop out for a few hours. Luckily the weather people were right on it so I was able to plan for an early leave from work and get a few pictures of what will probably be the last of the dustings for this season. It's certainly been a long winter again this year. You've seen a number of pictures from Eschweiler if you've looked at the Far-West Germany gallery on this site, but this one is different in that it was taken from the platform looking towards the large S curve leading into the station from Cologne. My usual perch is near the concrete shanty in the right background or up on the noise barrier to the right. There are a number of angles possible here and I look forward to come back in spring to try them out as the evening light comes around more towards the west. Crossrail's 185s are kept busy with a number of pan-European trains. This one used to haul only gray Ewals containers but over the past year has seen more boxes by other freight forwarders adding some color to the mix. Crossrail 185 593 brings the Ewals-train 40162 (Novara/I - Genk-Zeehaven/B) westbound through Eschweiler Hbf. Night photography and snow go together well. 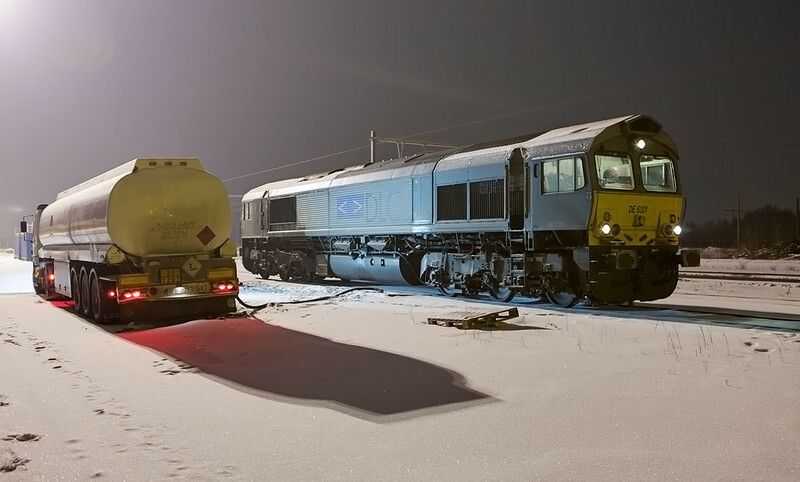 The huge floodlights in Montzen yard create an eerie scene reminiscent of a Star Wars landscape as DE 6301 quenches her thirst at Crossrail's "portable gas station". Tonight trains were detouring through the yard while MoW people were busy clearing the switches on the main with leaf blowers. 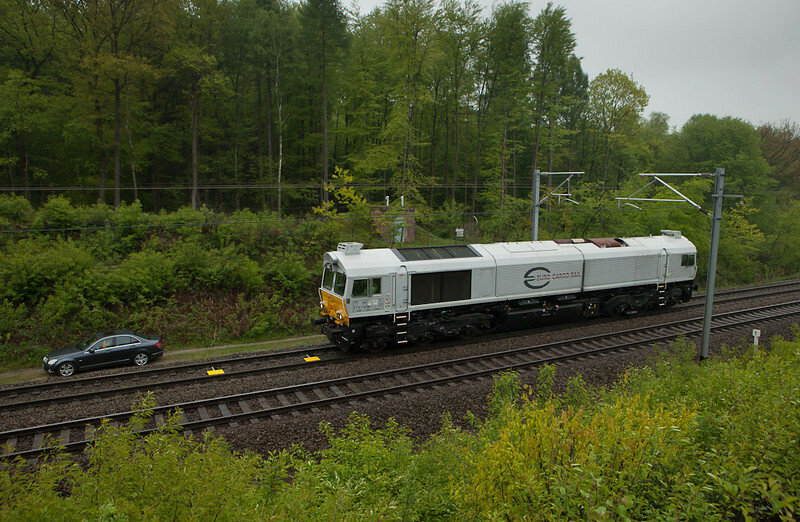 Crossrail/DLC DE 6301 in Montzen. HDR image composed of 4 shots. We've had a nice winter so far, with several good deposits of snow. Our fourth helping arrived today, bringing with it the usual chaos on the roads. While a nationwide ban on driving trucks was trying to dissolve the gridlock on the highways, the railroads operated relatively normally. Here 2819 has delivered the loaded Oberhausen limestone train to Aachen West and returns with the empty counterpart in fine style. The entourage has just passed idled Block 16 on the east throat of Montzen yard. 2819 races empty limestone train 48566 (Oberhausen/D - Hermalle s/Huy) through Montzen past Block 16. 2010 seems to start very nicely. The expected traffic lull has been much less pronounced than last year, probably a sign of the economy being better. Additionally, we have had snow on the ground since New Year's eve. Undisturbed by wind it also decorates the trees in a very picturesque way. Add sun to that and the enterprising foamer just has to get out and take photos. 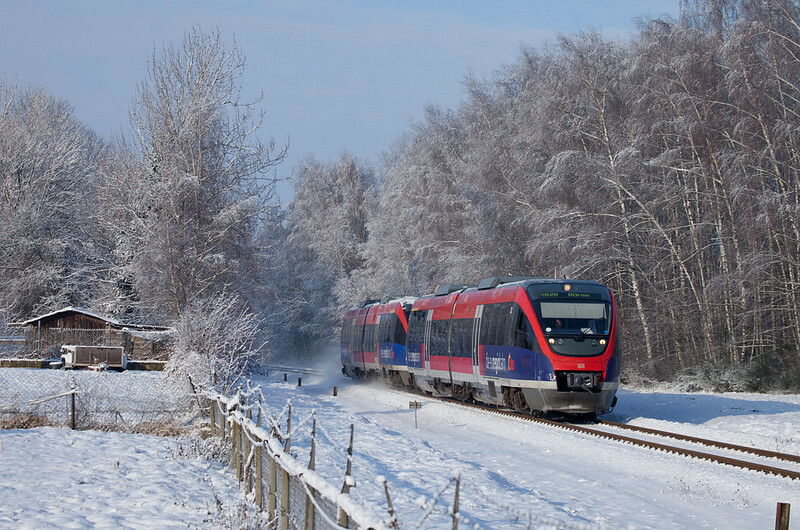 Here's a colorful scene as an Euregiobahn Talent running between Heerlen/NL and Dueren/D approaches Haanrade in the Netherlands. In just 2 km it will cross the border into Germany for the remainder of its trip. Have a great, healthy, and happy 2010 and may your wishes come true, whatever they may be. 2813 with the 44522 (Gremberg/D - Antwerpen-Noord) heads into the East Belgian mist as it passes Block 15 in Montzen. The time between Christmas and New Year's has been exceptionally busy for the railroads this year. Quite unlike 2008, they were running the wheels off the equipment. That and a few days off prompted a couple of unscheduled (though of course still enjoyable) outings. The westbound ore empties usually run Mo/We/Fr mornings, and today I caught them at Remersdaal, crossing over from 'B' to 'A' track. 'A' is still blocked - and in fact completely out in major parts - all the way between here and Montzen due to construction activities inside the tunnel and within the Hindel interlocking. Temperatures have been on a real roller coaster lately. Freezing yesterday morning, double digits and heavy rain today, and frost and snow forecast for New Year's eve. 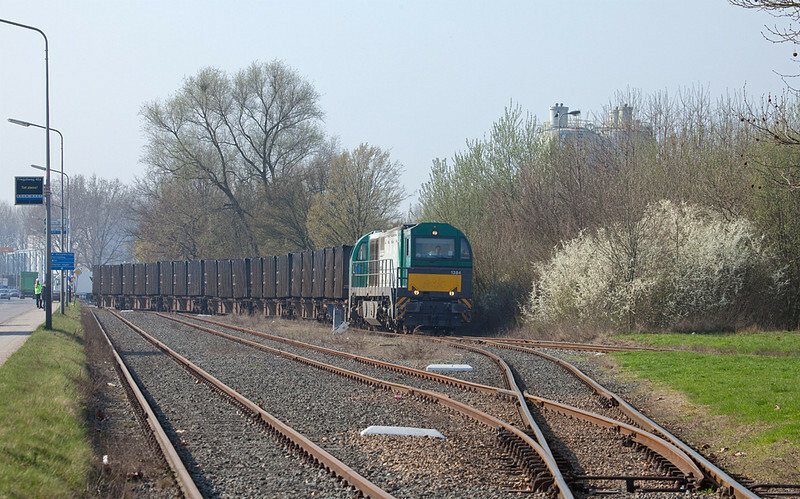 RTB/TSP MRCE 653-05 with the empty ore train 48510 (Stolberg/D-Lillo) in Remersdaal. 29-Dec-2009 Three of Crossrail's Class 66 units - PB12, PB13, and PB19 - lost their old beat-up DLC decals in Montzen today. A poor soul from RailServiceNet equipped with a hot-air gun powered by a portable generator scraped away at them relentlessly in the sub-zero temps. Whether they will be replaced with Crossrail decals, or whether the engines remain gray (or indeed are being returned to CBRail) is anybody's guess right now. Time will tell. Postscript: they were returned to the lessor. 23-Dec-2009 The year draws to a close in a hurry. 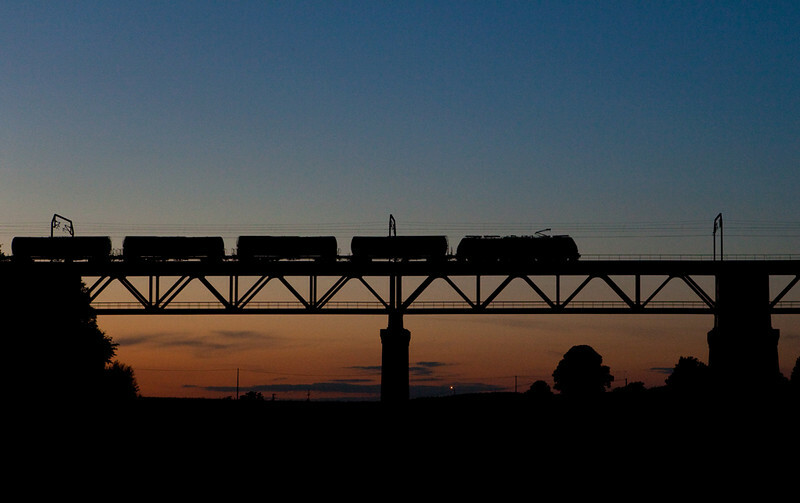 Starting tomorrow freight traffic will die down to a trickle into the new year. All the more reason to make use of the nice weather for which will probably be the last outing for 2009. The Wednesdays-only gas tank car train from Dormagen to Lutterade/NL and back was scheduled inconveniently, but by a sheer stroke of luck it was delayed over 3 hours and I coincidentally caught it while hanging around Aachen Hbf. Here it accelerates out of the station after a new engineer stepped on board. The train was featured previously here - in much warmer weather! - on 26th of August. The tower on the building in the right distance is a meteorological column, one of the few remaining operative ones in Europe. A German description can be found here. Merry Christmas, everybody - may the holiday season be kind to you. R4C/Veolia CB1000 (EU06) drags the heavily delayed 47712 (Dormagen - Lutterade/NL) through Aachen Hbf en route to the Netherlands. 19-Dec-2009 2373 and 2370 are in charge of a gas tank car extra to Montzen at Remersdaal. The train is headed for short-term storage in Montzen due to capacity restraints elsewhere on the system. In late 2009 these moves, though unscheduled, are a regular assignment for the old electrics which thus make their (temporary) comeback to the L24. It seems like Montzen yard can still be useful after all. 1-Dec-2009 The dark winter months are a bit of a challenge for photography. Once you look past the "sun over your shoulder" paradigm, though, I think the subdued light and moody colors actually offer a lot to the enterprising photographer. 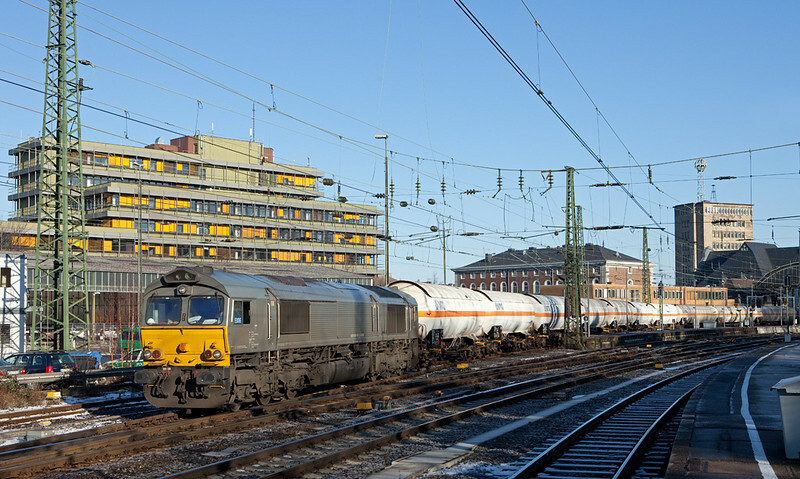 Here's Traxx 2822 with a chemical train bound for Antwerp from Germany. The move has crossed over onto the normal (left) running track at Block 16 in the background and skirts Montzen yard westbound as it continues its journey. Much of the cross-border chemical traffic moves in tank cars, but some also travels in containers as evidenced by the mixed consist seen here. 2822 with chemical train 41548 Ludwigshafen/D - Antwerp-BASF) passing Block 16 in Montzen westbound. 21-Nov-2009 Montzen yard continues to see some activity 11 months after B-Cargo pulled out. 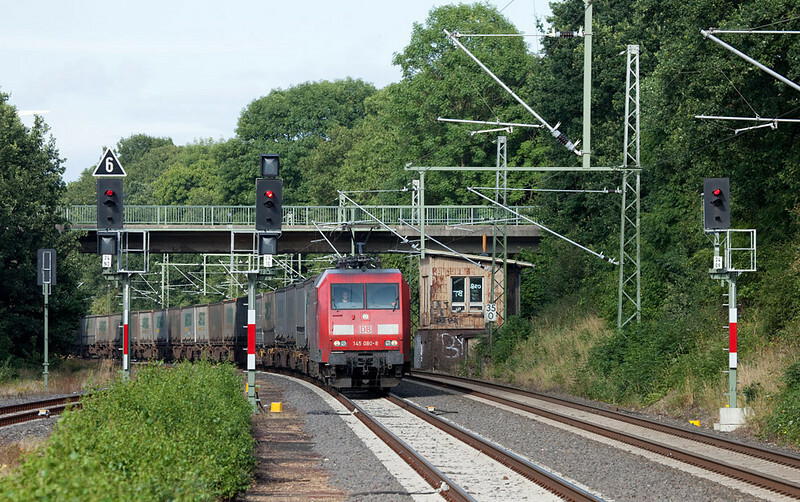 The private guys still make use of track capacity to store trains, as evidenced here by Trainsport (Rurtalbahn) with a Ford train with their blue G2000 V203 for power. TSP seems to always have a few engines around, their class 66 and another G2000 with a sugar train were present as well. They usually congregate around tower 15 in the middle of the complex, while DLC parks their 66s near their "gas station" on the south side near the customs shed. 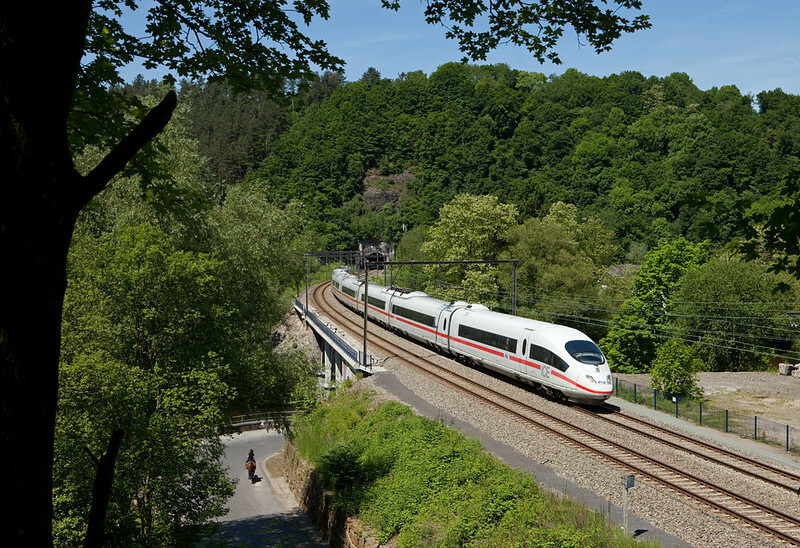 Rurtalbahn/Trainsport G2000 V203 with Ford autotrain in Montzen. 15-Dec-2009 Just a quick mention to let you know the Settle & Carlisle in November and Peak District galleries are now up and ready for your viewing pleasure in the Great Britain section. 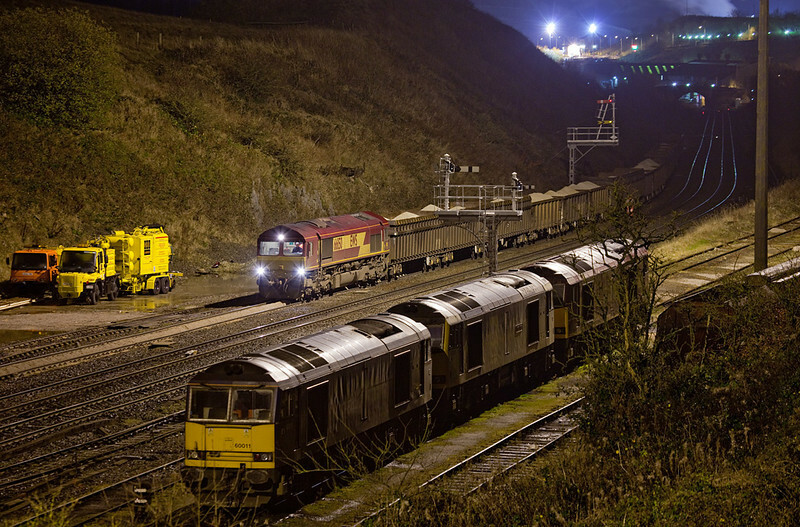 EWS 66150 shunting at night in Peak Forest South. 15-Nov-2009 Just returned from a gorgeous week of railfanning in absolutely abysmal November weather along the Settle & Carlisle railway in Yorkshire and in the Peak District of Derbyshire. November rain and darkness - challenging; inspiring; different. The pictures are now available in two galleries in the Great Britain section. 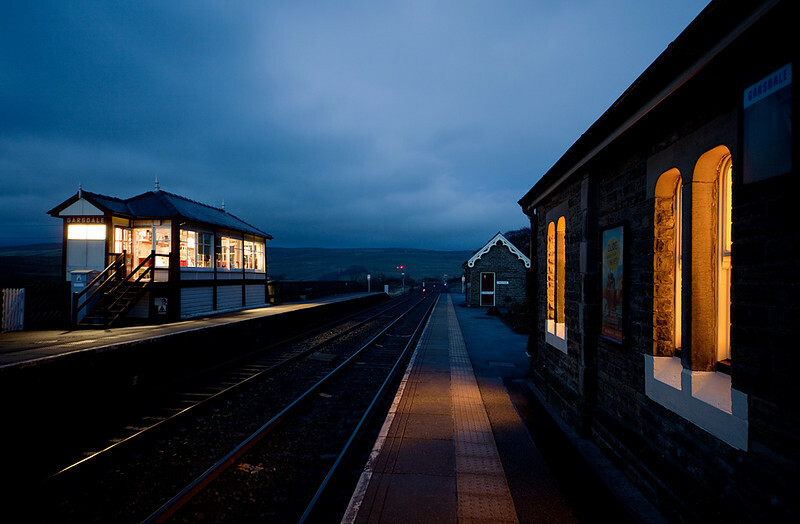 Garsdale in the blue hour - station and signal box, looking north. 29-Oct-2009 I was required to take a short trip to the British Midlands at the end of October. A few trackside hours could be woven into the schedule. Pictures have been uploaded to the Worcester & Warwickshire gallery in the UK section. Interestingly, this trip came almost exactly one year after my first trip to the UK, also the weekend after change to winter time. Amazing how the months fly past... Anyway, here is a teaser with my favorite train of the week, the soon-to-be-rerouted 6Z48 in charge of Colas' finest at Leamington Spa. It had to stop to let a Crosscountry Voyager in from the Coventry branch to the right, then throttled up and ran through the station on the through track. Colas Rail 47812 alias D1916 with the 6Z48 (Burton-upon-Trent to Dollands Moor empty steel) accelerates into Leamington Spa. 20-Oct-2009 A recent road trip allowed for a short stopover/food break in southern Hamburg. A strategically located KFC next to the main freight artery into and out of the port cannot be a bad combination. Within a few minutes this Eurorunner - EVB 42011 - appeared with a container train in tow. Weekdays will net many photos in a short time as the railroads continue to carry a lot of freight, economic problems or not. 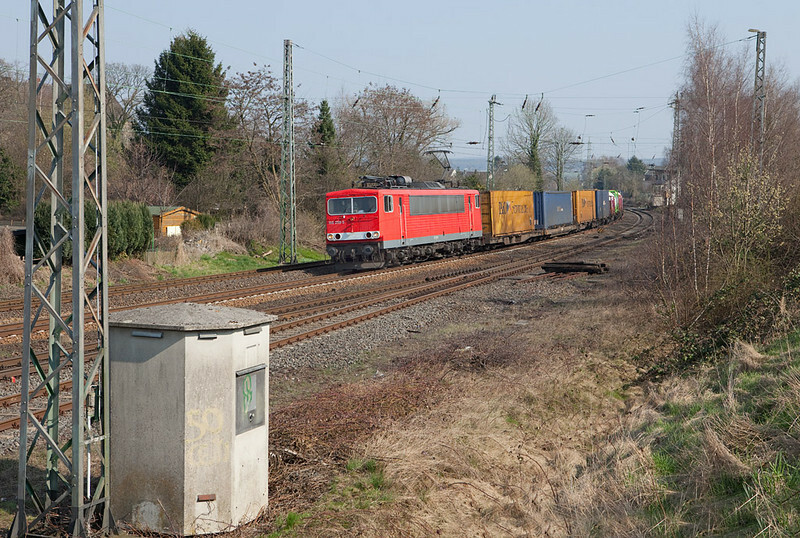 EVB 42011 with container train eastbound in Hamburg-Hausbruch. 17-Oct-2009 An unusual guest visited Montzen yard this weekend. It is 1812, one of the new class 18s being delivered to SNCB by Siemens (not to be confused with the vintage class 18 multisystem Co-Co engines). Here is a closer view of the engine. Here it is parked next to the still impressive tower 15. To the left sit two Rurtalbahn Vossloh G2000s, and behind them their class 66. The line of derelict cars is owned by a private collector. As if all that weren't colorful enough, dual rainbows announce an approaching rain shower. 14-Oct-2009 Hot air ballons are a popular means of sightseeing in this area. 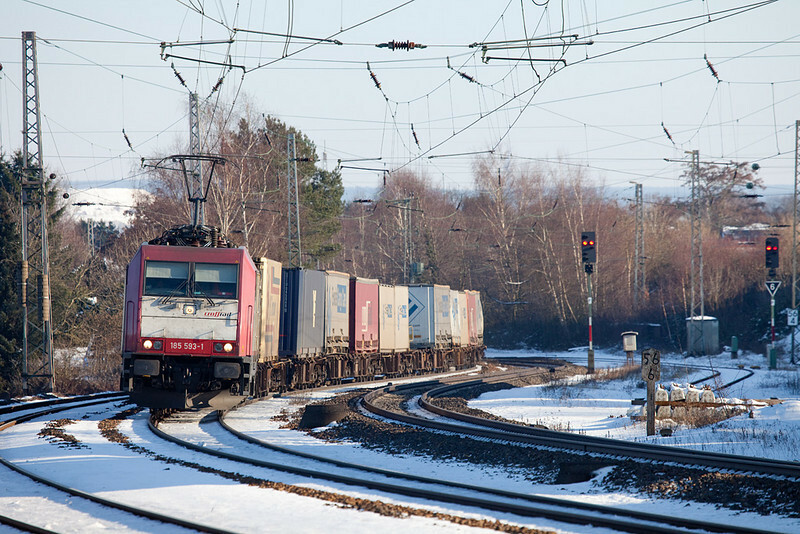 Here two lift off from Trois Bornes ('three frontiers' in French) into the evening breeze as an empty limestone train returns from the Ruhr area in Germany for another load of the white stuff from the Maas valley. These trains are a good indicator of the economy as measured by the output of the steel mills. At the height of the economic crisis of 2008/2009, they would run maybe once a week with 6-8 cars. Now they are back to their normal thrice-weekly schedule and generally are between 10 and 18 cars long. By the time the photo was taken temps were almost at the freezing point. We hit -6 C that night - quite unusual for October. Limestone empties 48566 (Oberhausen/D - Hermalle s/Huy) crossing the viaduc de Moresnet. 13-Oct-2009 Fall is coming fast to eastern Belgium. The first of the "production" class 28s emerges from the deep shadows as she brings her train underneath the new bridge at Nouvelaar en route to Zeebrugge. Photo time is getting shorter every day as we head towards winter. There won't be many more after-work outings with the changeover to winter time in two weeks. 2804 leading the 40216 (Desio - Zeebrugge-Vorhaven) in Nouvelaar. 26-Aug-2009 Merely a week later and I'm back in the Netherlands, in Sittard. Objective of the outing was to finally catch the SNCF Fret's CO2 train in good light (which worked). The wednesdays-only Rail4Chem train between Dormagen/D and Lutterade was the bonus prize. 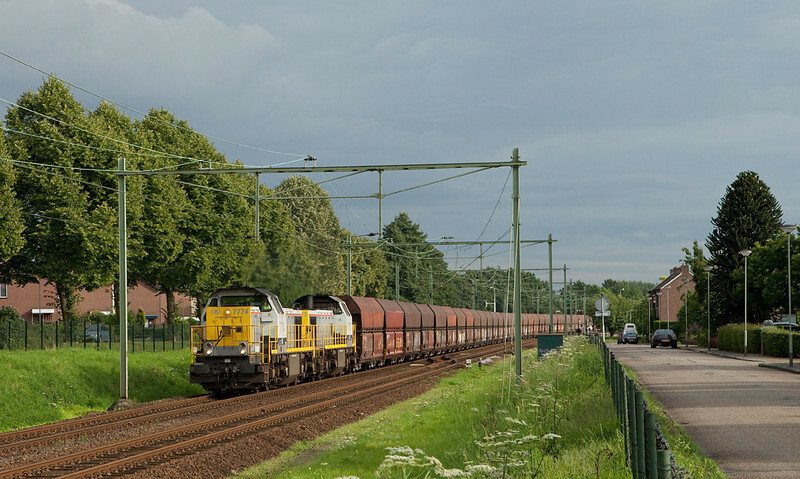 Here PB01 comes sailing through the crossovers at the south end of Sittard, yarding her train in preparation for the runaround and short jaunt south into the DSM plant at Geleen. R4C PB01 leading the 47712 (pressurized gas tank cars Dormagen/D - Lutterade) into Sittard. 19-Aug-2009 I returned to the Netherlands for a mid-week show of freight traffic around Sittard and Lutterade this week. There's a surprising amount of traffic in the area to fill a day with if you plan your moves carefully (and take a good look at the schedules so graciously provided by Rolandrail). There's still just barely enough light for the northbound limestone train this time of year. In about two more weeks the shadows will swallow it for the next 8 months - assuming it keeps operating... 7775+7772 yarding the limestone train 48555 (Yves-Gomezee/B - Millingen/D) in Sittard. 16-Aug-2009 I have not paid many visits to the L24 this year. Truth be told, there are nicer ways to bore myself than with an endless parade of Traxxes, all looking alike. Today I only had a little time on my hands so a quick hop to my ex-favorite haunt was in order. Infrabel was kind enough to cut down the forest for 30m either side of the tracks, providing nice open views. Obviously the omnipresent poles don't help, but what are you really gonna do... Here's the last and final Traxx, 2843, still nice and clean in a fresh coat of paint from the manufacturer. 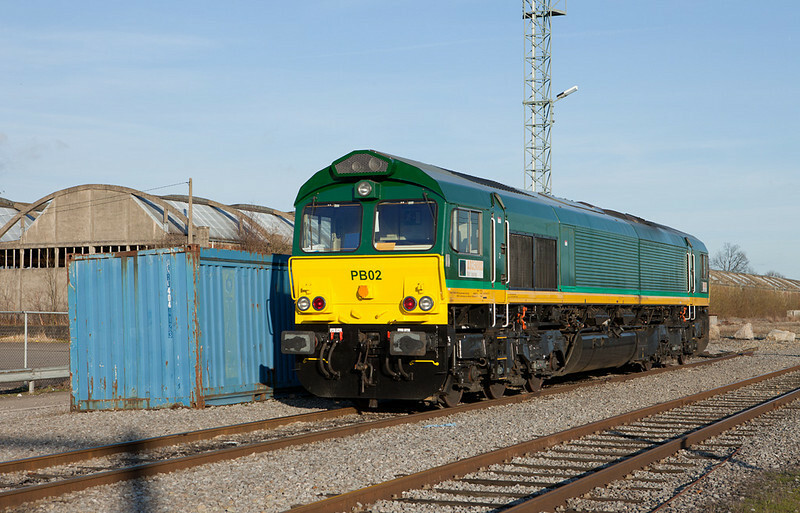 A number of the locomotives have been rented out and assigned to passenger train service as train count and freight volume for B-Cargo is still about 45% down year over year. 2843 leading the 44532 (Gremberg - Antwerpen-Noord) southbound (timetable west) near the Rue d'Aix. 27-Jul-2009 A quick after-work-foam took me to Bunde in the Netherlands. This is a small village just north of Maastricht on the line through Sittard towards Roermond and the north of Holland. 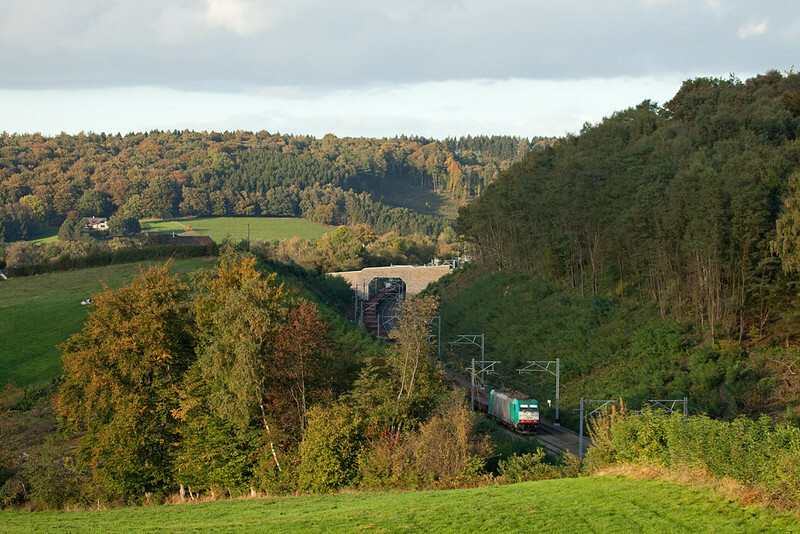 The line is an extension of the Belgian Meuse Valley line, the L40. Being in the tri-country area, here's a truly international train. It carries limestone from a quarry in Yves-Gomezee near Charleroi, Belgium to the blast furnaces in Millingen, Germany. The cars are German, power is Belgian, and this photo was taken in the Netherlands. 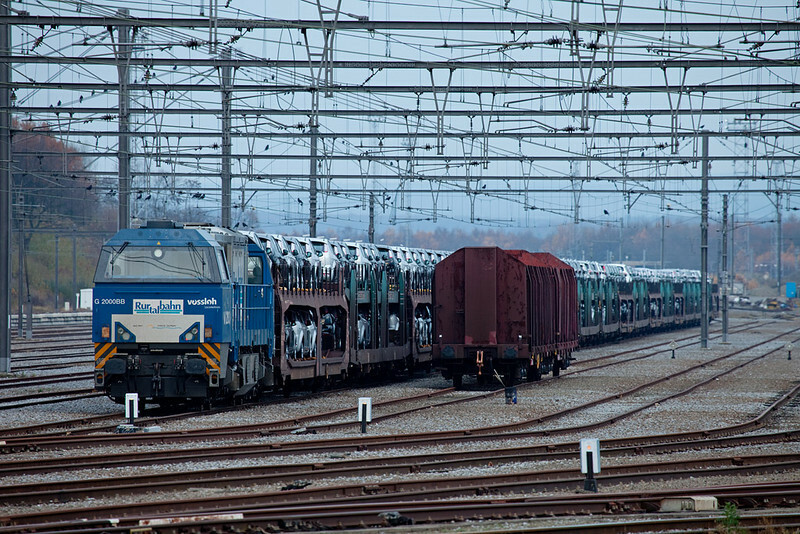 This is not a bad train by European standards, 30 cars or around 2400 tons. The 77s sound great with a decent load. Being a northbound, light is best in mid-summer. 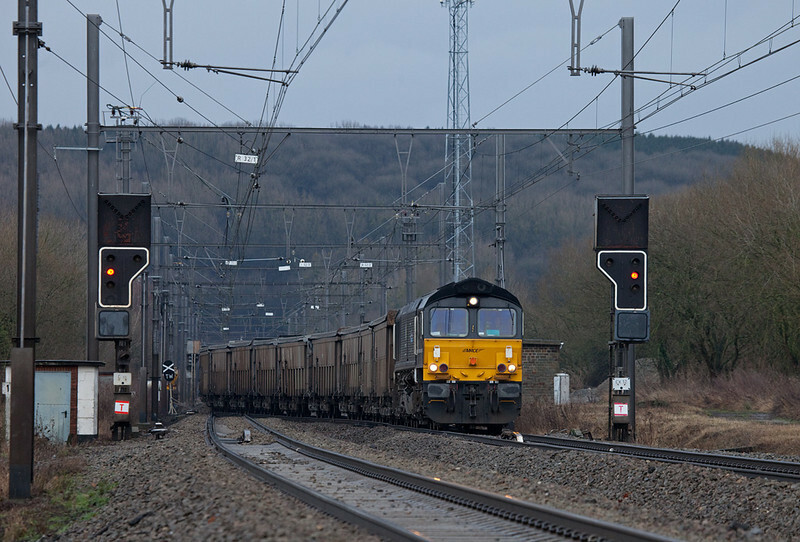 B-Cargo 7774 and 7773 haul the loaded limestone train 48555 (Yves-Gomezee - Millingen) through Bunde. 24-Jul-2009 The diverted freights are unusual enough to warrant another outing. Friday's weather ran the gamut from torrential rains to bright sunshine and blue skies and back within 10 minutes. 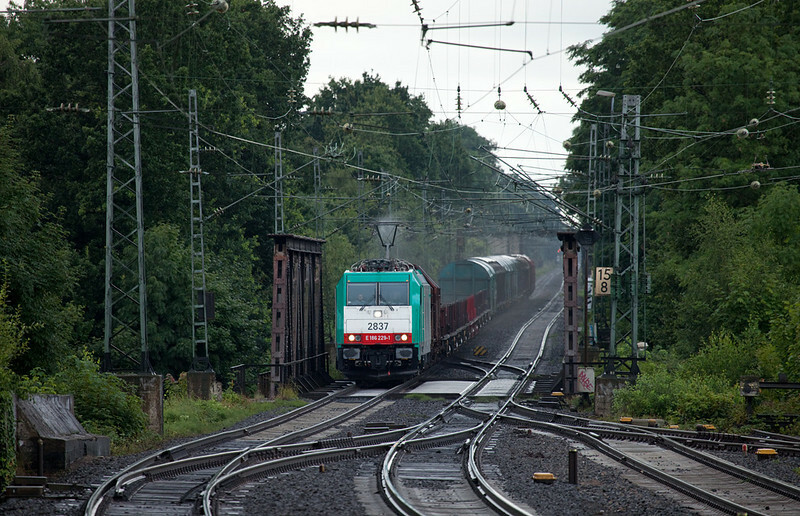 Shortly after a downpour this Traxx brings a steel train down the steep incline from Kohlscheid into Herzogenrath. The catenary is still dripping wet as the pantograph creates a nice misty swirl. Even bad weather has its advantages, it doesn't always have to be sun-over-your-shoulder. A platform shed that keeps you nice and dry is an asset, though... Cobra 2837 on the FE 44565 (Kinkempois - Gremberg) approaches Herzogenrath northbound. 23-Jul-2009 This week freight traffic is diverted from the main traffic artery between Aachen and Cologne due to construction curfews. The trains continue north through Cologne, west to Grevenbroich between Cologne and Düsseldorf, and then head due south along the 485 to Aachen. This is a rare opportunity to photograph more than the usual trickle of freight traffic on this line. 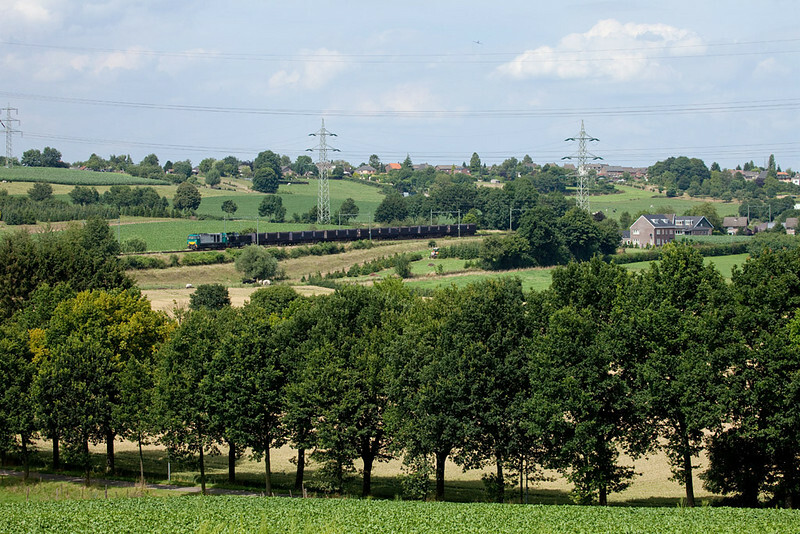 Here one of the signature trains, the Ambrogio intermodal to Muizen/B, passes the abandoned tower Ln in Lindern, about 30 km north of Aachen. This station was converted from manual block with semaphores only last year, 2008. 145 080 leads the Ambrogio intermodal TEC 40098 (Gallarate - Muizen) through Lindern. 16-Jul-2009 A beautiful, hot summer day and a few hours on hand resulted in another chase of the ACTS trash train from Haanrade to Bunde via Beatrixhaven near Maastricht. 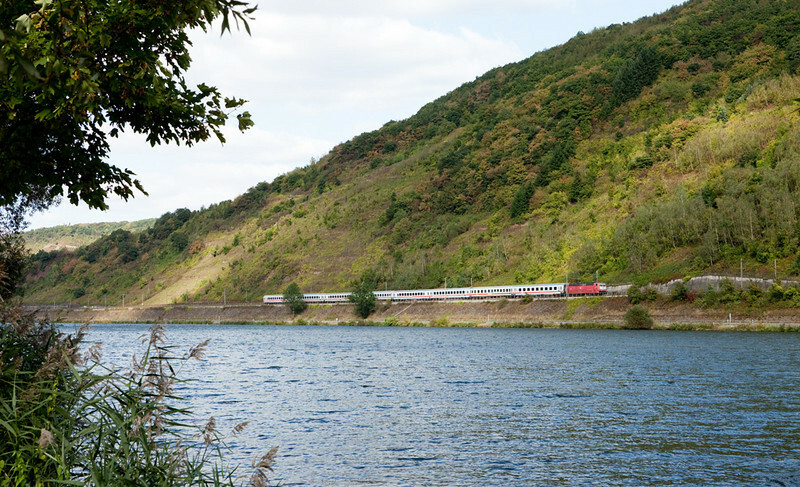 Here the train is running through the beautiful Heuvelland region in Dutch Limburg. ACTS G2000 1001457 with 50094 near Schijn op Geul. 28-Jun-2009 Just returned from a short week in Budapest, Hungary. It was my first trip down there and I had a chance to sample the great trolley network they are running throughout the city. Pictures and movies have been added to the trolley gallery. Here's a teaser. 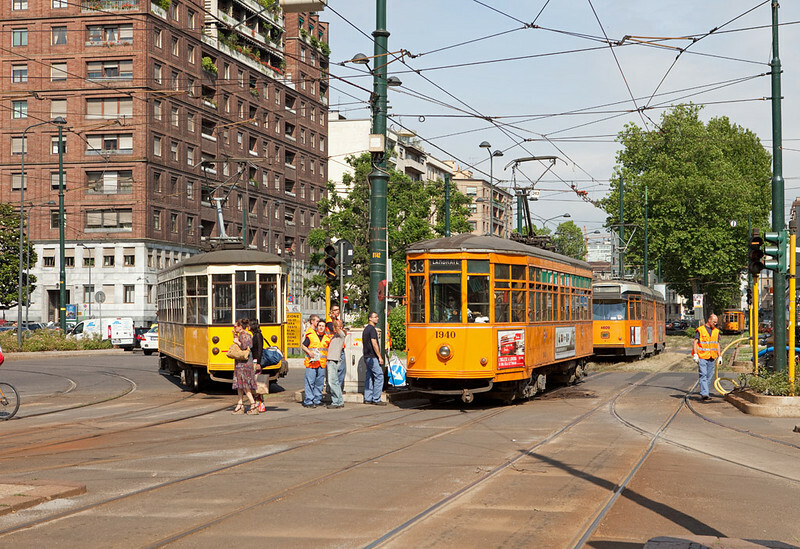 For more information about the Budapest tram network, check out the fantastically detailed Tram-Hiker's Guide to Budapest . 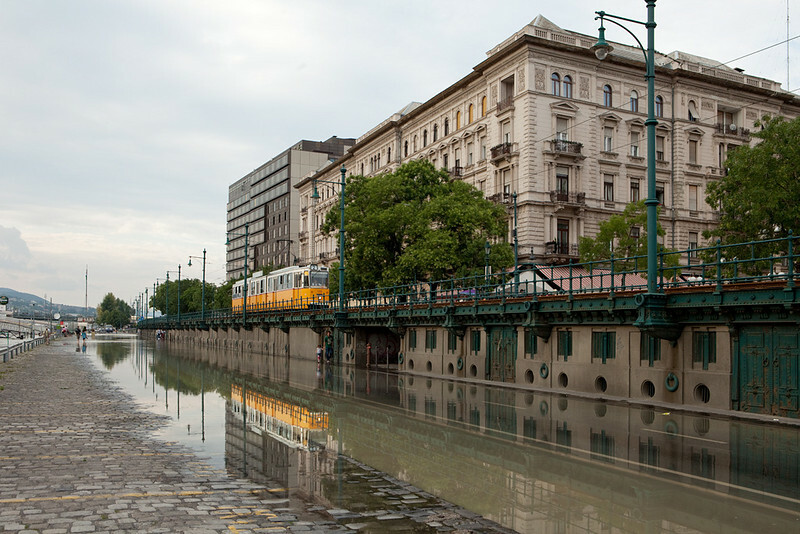 Ganz CSMG2 runs southbound on line 2 above the flooded river Danube. 19-Jun-2009 Home for a change. 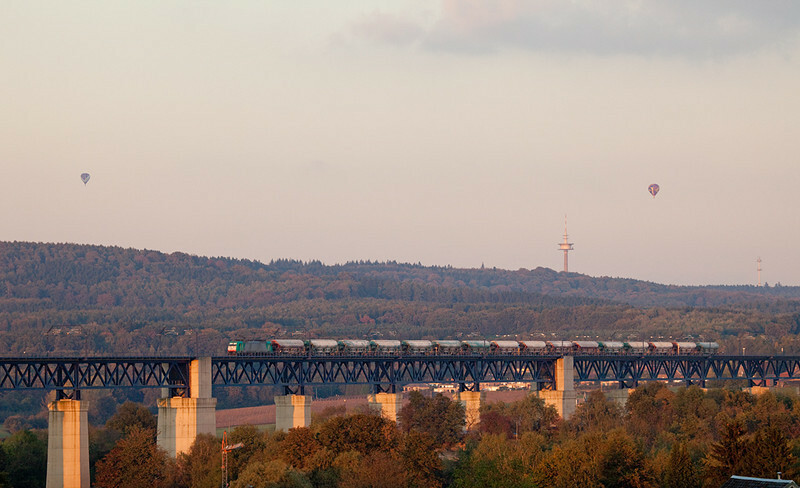 As we approach midsummer, the sun sets far enough north for the sunset to light up the skies behind the Moresnet Viaduct. 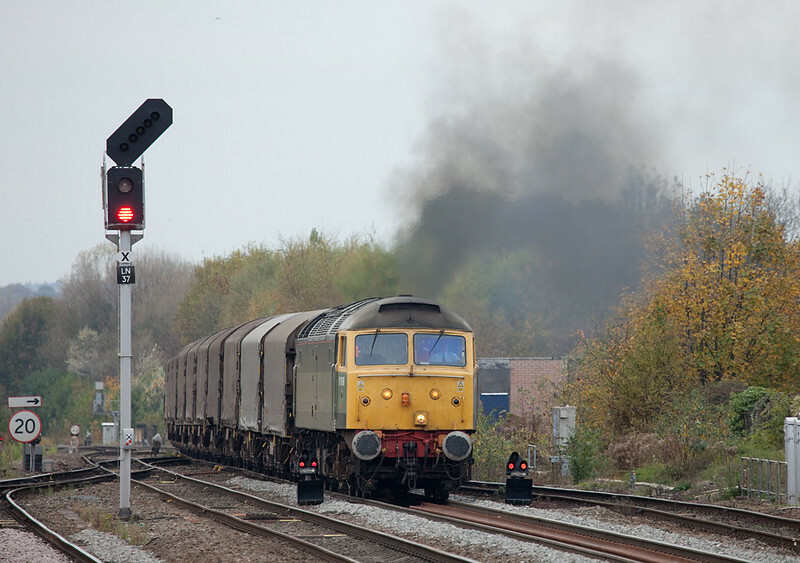 An eastbound tank car train is led by one of the now-ubiquitous class 28 electrics. Class 28 with tank car train at sunset. 5-Jun-2009 A business trip to Stockholm, Sweden netted a couple of hours for photography, albeit in the rain. 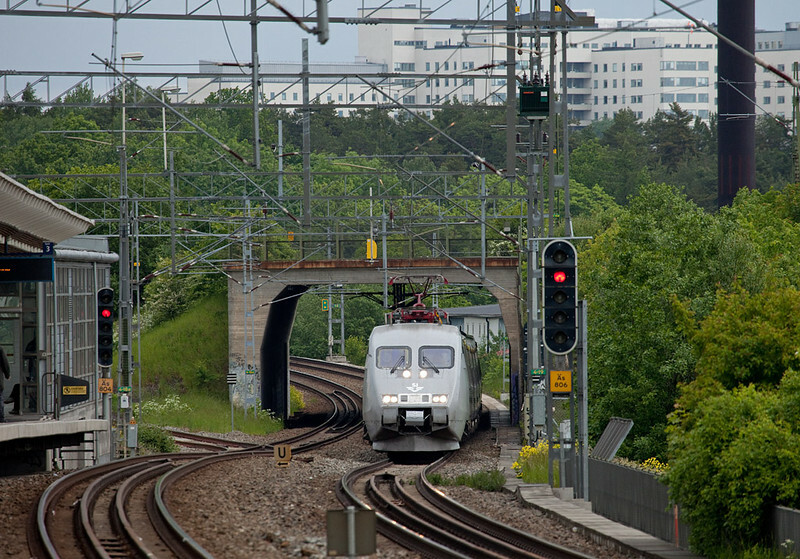 Here's the granddaddy of Scandinavian highspeed service, the X2000, running through Arstaberg station on the south side of Stockholm on its way towards Linkoping. X2000 in Arstaberg. 24-May-2009 Spent three intense days along the L37 through the lovely Vesdre Valley. This is the original 1841 alignment of the first international railway line linking Germany and Belgium, and one of the first major railways built in Europe. 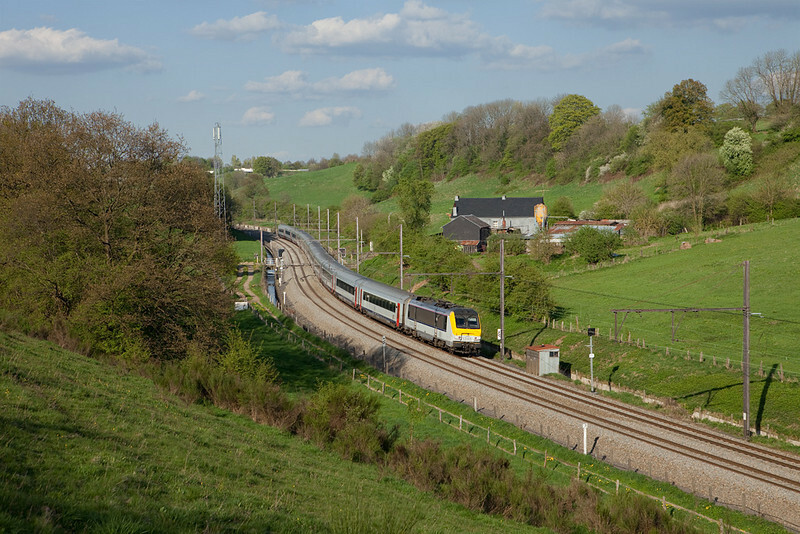 To this day the ICE and Thalys high-speed trains utilize this historic line between the border and Liege/B, running at much-reduced speed due to the excessive curvature. This era is about to come to an end, though, as June 2009 will see the ICEs move to the new, parallel LGV3 which will shorten running times considerably. 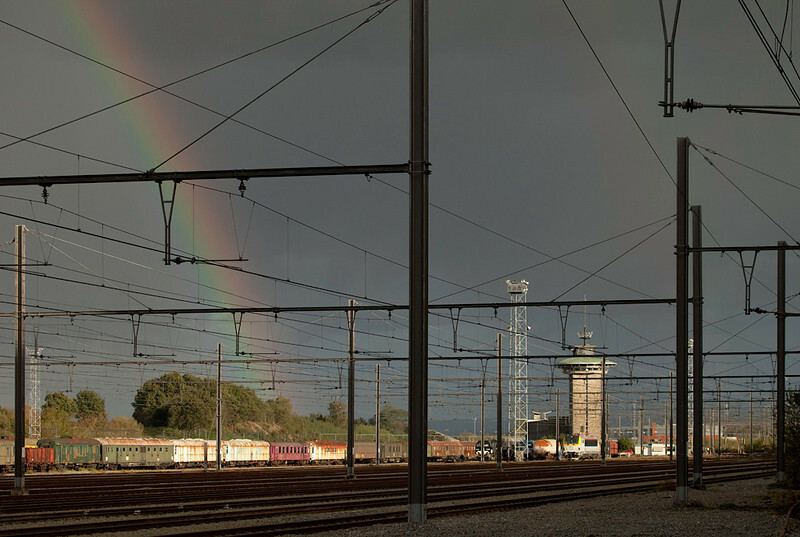 The Thalys are expected to follow suit towards the end of the year, when their ETCS installation is completed. Reason enough for a visit to sample the beautiful scenery and take in some early summer sunshine. It seems road transportation hasn't changed all that much in the interim 168 years... 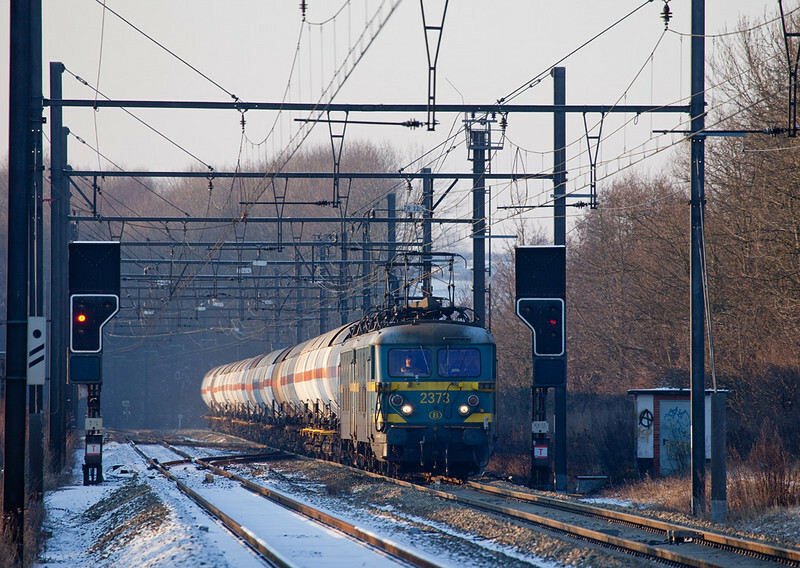 Note this is a Dutch Hispeed-owned, German-built ICE3M, on its way from France to Germany, photographed in Belgium. Welcome to Europe! 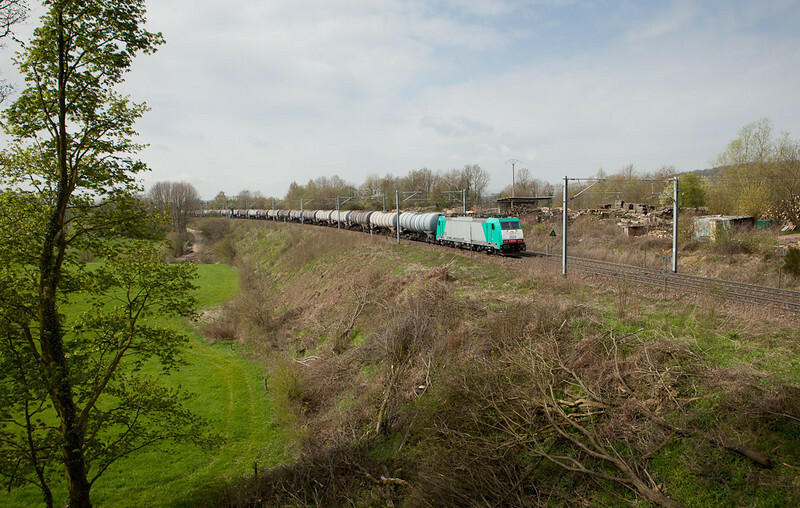 ICE3M eastbound en route from Paris/F Gare du Nord to Frankfurt/D passes Goffontaine in the Vesdre Valley. 3-May-2009 Just returned from a very enjoyable trip to the Settle & Carlisle in North Yorkshire, with a few days around Barnetby, North Lincolnshire, tacked on for good measure. Photos from the trip are now stored in two folders on the UK galleries page. Here's a teaser. 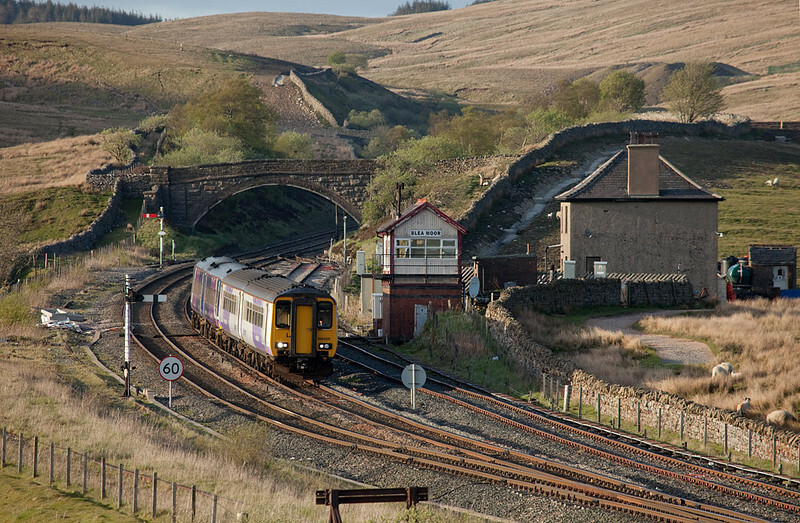 156 425 bound for Leeds heads through Blea Moor. 24-Apr-2009 Another shot from the L37, this time a bit further north than the picture taken on the 22nd of April. The modernized AM70s in contemporary grey livery are easy to spot by the blanked-out left hand side window. Closing in on 40 years of service, the simple but dependable EMUs continue to be a staple on local trains across the country. AM70 659 passes underneath the Rue Lancaumont as it leaves Welkenraedt bound for Liege. 22-Apr-2009 The relatively small town of Eupen in eastern Belgium boasts an hourly Intercity train, the IC-A to Oostende, as its only long-distance train service. The service is quite popular with riders from Liege on west so it is generally run with 11 coaches including a cab-control car and a class 13 electric in push-pull configuration. For the Paysage de l'Ardennes Bleue it is decidedly overkill, but makes a fine sight nonetheless. 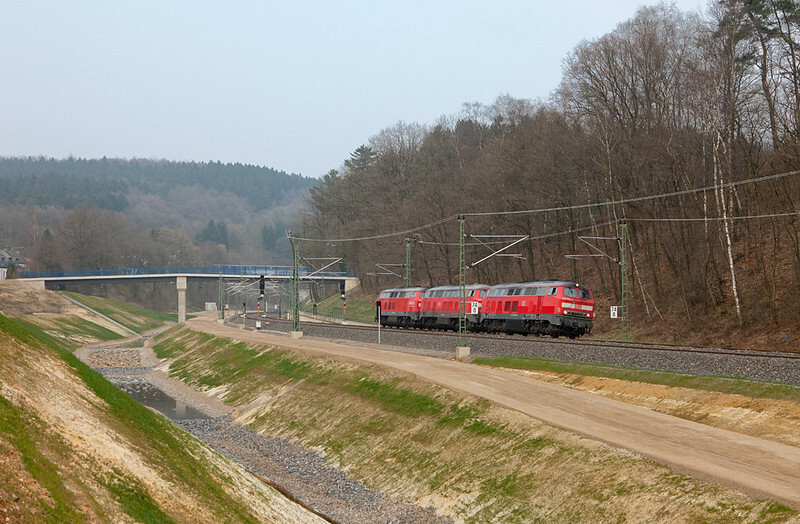 Here one of today's trains on a westbound run descends into the valley of the river Vesdre between Welkenraedt and Dolhain-Gileppe. The L37 is one of the oldest railway lines in Belgium, completed between Köln/D and Liege in 1843. 1349 with Oostende-bound IC-A near Heggen. 19-Apr-2009 Had to take a road trip this weekend, and managed to stop for a short look-see at a location I hadn't previously been to - Ashausen, south of Hamburg on the busy north-south line through Hanover, Fulda, and Würzburg. (click on "Map This" at the top of the page to see the location for this and the other pictures on this page) Being a Sunday freight was relatively scarce and in fact this was the only one in good light. It is the westbound empty ore move from the Peine-Salzgitter blast furnace in Salzgitter-Beddingen to the Hansaport ore transloader in Hamburg. The attractive train is complemented by Ashausen's signal gantry and not-too-ordinary pedestrian bridge. 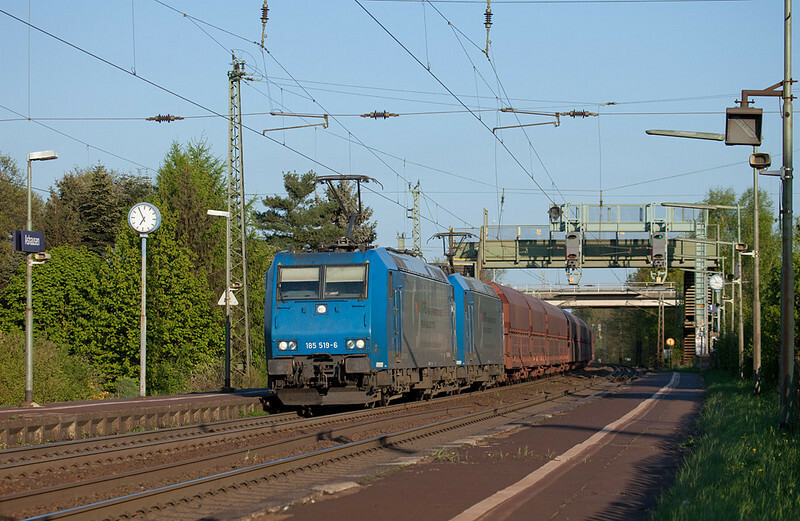 VPS 185 519 + sister with empty ore train Salzgitter-Beddingen - Hamburg Hansaport in Ashausen. 4-Apr-2009 The weekend of the 5th of April the L24 was shut down for trackwork and trains were diverted via the L39 and L37 Montzen - Welkenraedt - Aachen Süd - Aachen Hbf and return. Even though the class 225 diesels have not been around since December 2008, they are still the only class of engine save for the class 66 that was usable for the detours. Good thing Cobra spends millions on the Traxx lease... Anway, here's a trio of 225s heading for Montzen to pick up the first train of the day. One 225 will lead towards Germany while the two others will shove on the rear. The area here shows evidence of the massive earthwork undertaken when the old flyover and connection to the L24a was removed the previous year. 225 029 with 225 027 and 225 028 in tow south of the Buschtunnel. 3-Apr-2009 I have wanted to follow one of the ACTS trash trains in the Limburg region of the Netherlands for quite some time, and on the 3rd of April I finally did. ACTS serves a number of transloads, including one in the Beatrixhaven industrial estate north of Maastricht. Here we see rented Vossloh G2000 1384 (with the odd asymmetrical cab) after having pulled the Essent facility and backed the train down to the little yard. As soon as the brakeman has walked back to the engine they will pull out, run down the main south into Maastricht, pick up the other half of their train (from Haanrade) left there, and run north to Wijlster. 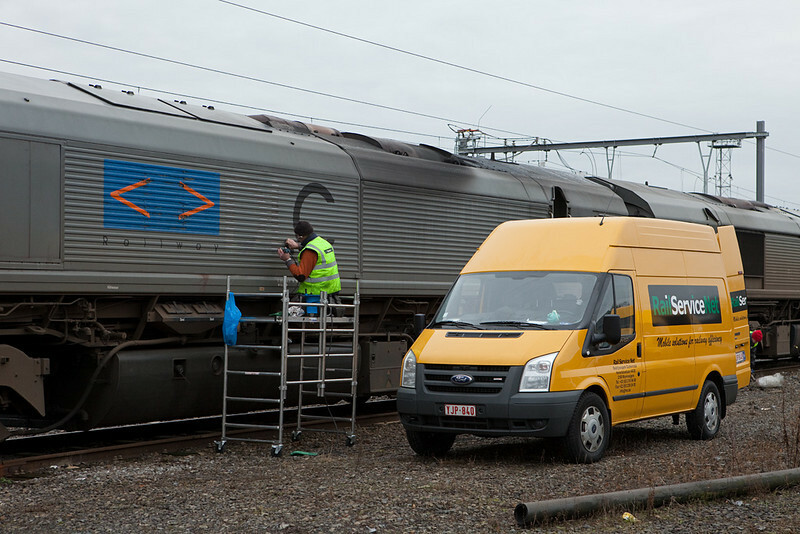 This G2000 will be returned to Vossloh on the 4th. 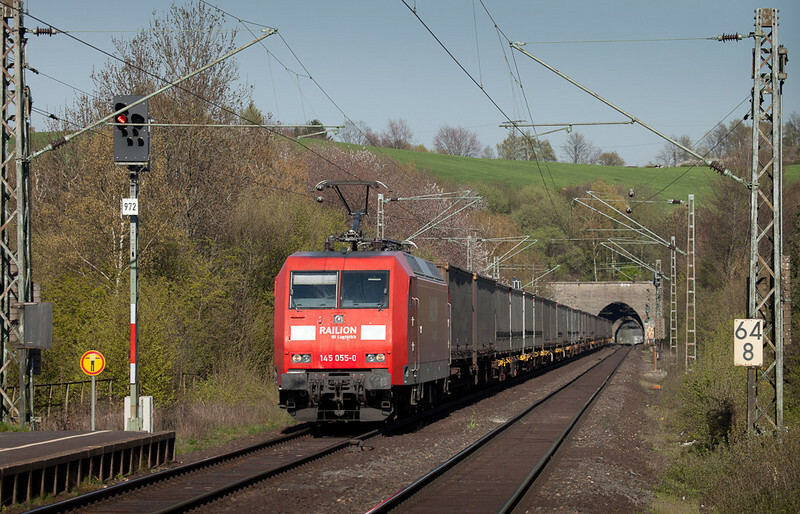 ACTS at this time receives a total of 6 G2000s to pinch-hit for their fleet of G1206s which are having a/c units installed at Vossloh in Moers. Good move; as can be seen by the blooming bush, temperatures are on the rise. 24 degrees C and counting... Vossloh 1384 with the ACTS trash train 50101 (Beatrixhaven - Maastricht) in Weert. 1-Apr-2009 It's springtime! Temperatures soar, the sun's out, trees and bushes are about to burst into bloom. Time to get out - get it while the getting's good... The getting was fairly good in Eschweiler, between Aachen and Cologne. Regular readers will have noticed it's one of my favorite spots to hang out. Good sight lines all day long, early traffic warning afforded by crossing gates, quiet, off the beaten path. And generally good traffic, although there is a marked decrease when compared to last year; on account of the economy. 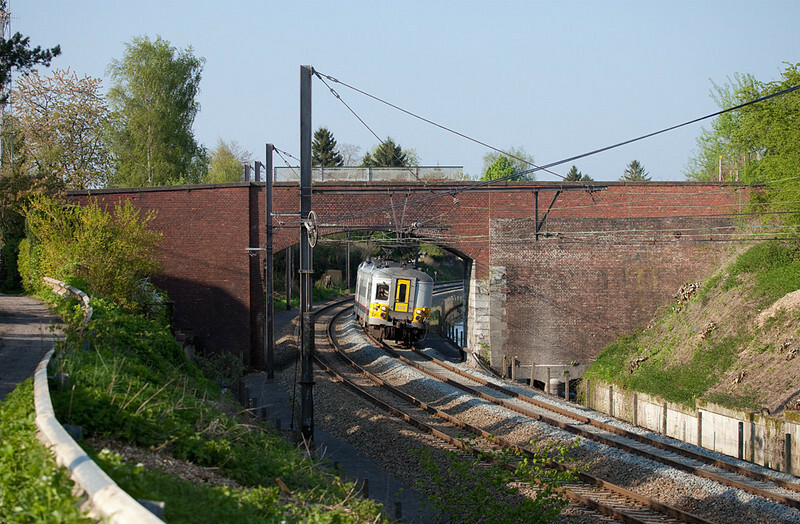 Here we see a class 155 westbound with an intermodal train. As DB Schenker culls their fleet of older units rendered surplus by the slacking economy, these venerable Co' Co' survivors from ex-East Germany are acutely endangered. Rumor has it they as well as the 50+ year old class 140s are to be sidelined soonish. So getting a good shot of a rather clean unit is all the more satisfactory. Here is another view from the day, illustrating a slightly different angle obtainable from the same spot. 155 259 with the 40158 (Milano/I - Bierset/B) in Eschweiler.